"Seeing red squirrels back on our Craigiebuckler site is not only great for our staff, visitors and local community who can now enjoy watching the antics of this iconic species but this is also a really positive sign of how local restoration efforts can make a real difference to the global challenge of halting biodiversity losses"
There have been three significant red squirrel sightings in recent weeks: one on the grounds of the James Hutton Institute in the west, and two further sightings near the University of Aberdeen, just north of the city centre. The rare sightings, which were reported to Saving Scotland’s Red Squirrels, provide further indication that red squirrels are returning to their old strongholds. The sightings are some of the closest to Aberdeen city centre recorded in recent times, suggesting that red squirrels are gradually making their way back to the city’s parks and gardens after decades of absence. 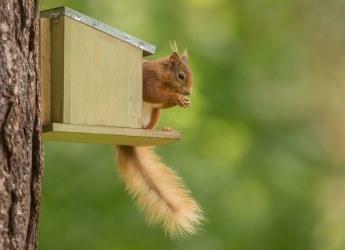 Red squirrels were once common across Aberdeen. However, they have been replaced by the non-native grey squirrel, which out-competes reds for food and shelter. Professor David Elston, director of Biomathematics & Statistics Scotland (BioSS), first spotted the red squirrel and reported it to Saving Scotland’s Red Squirrels. He commented: “It's several months now since I last saw a grey squirrel in the trees outside my office window, and I have heard about recent sightings of red squirrels not too far away. While three quarters of the UK’s red squirrels are found in Scotland, their numbers have fallen drastically to just 120,000. This is largely due to the spread of the grey squirrel, which was first introduced to Britain from North America in the mid-19th Century. In the 1970s another group was released in Aberdeen, creating an isolated population that has rapidly spread throughout the city and into surrounding Aberdeenshire. Saving Scotland’s Red Squirrels is a partnership project led by the Scottish Wildlife Trust and made possible thanks to National Lottery players. With the help of a network of dedicated volunteers, Saving Scotland’s Red Squirrels is working to reduce grey squirrel numbers in the region with the aim of removing them completely, allowing native red squirrels to thrive once more. Members of the public are encouraged to help the project monitor the situation across the country by reporting any squirrel sightings (red and grey) at scottishsquirrels.org.uk.